There is good opportunity to practice communication skill safely and cheerfully. Thanks to all the members and guests for making our club successful. This was the very last meeting in the 2017-2018 Term: Cosmos Club’s fifth year. It was the perfect timing for each one of us to review what we have done in the year and plan how our next term will look like. Opening: TM Yuka has given the warm-hearted opening addresses throughout the term. She has been constant, reliable, and not been afraid of any challenges confronting the club. 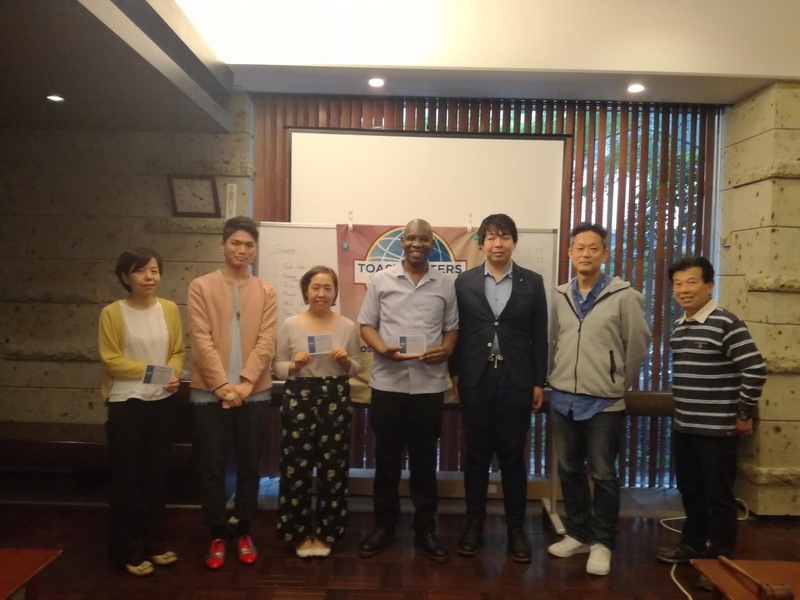 Voice Training: TM Itaru introduced an interactive session among members, which was fun; meeting up a person next to you and interview why he/she joins Cosmos TMC. TMOD: TM Hirohisa was fully prepared with passion and empowered members to get started with Pathways. Grammarian: TM Yoshiko, Area 24 Director kindly took the role despite of its short notice. Thank you for your kind support and contribution! 2nd Speaker: “What is Trademark” by TM Ken, explaining the difference between Trademark and logo in a professional manner. 3rd Speaker: “That’s Why I am Here” by TM Yukako, a perfect summing up what TM means and how the club activities have affected her. 4th Speaker: “Importance of building a consensus ” by TM Kazuki, talked about tips and importance of making consensus in the workplace. She gave us seasonable and good topics.Guests were also invited to try it out. 2. Refraining the line used in the speaker’s speech, which remind the audience and reinforce the evaluator’s points to make. The last regular meeting in this term was successfully adjourned.Hope we create fruitful learning place from next term , July continuously. 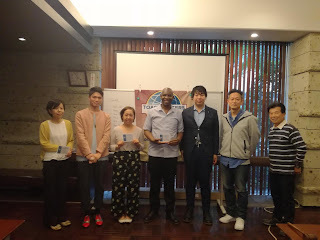 Cosmos toastmasters members enjoy learning together.We always welcome your visit. ◆Please check the page of "meeting schedule " as for our meeting schedule and venue. We tried holding the regular meeting Japanese for the first time. It was　challenging and enjoyable opportunity!! 1st speaker TM Tsubasa "Lovely Day/ラブリーデイ"
audience. The speech itself was full of lovely. 2snd Speaker TM Chisako "一工程先はお客さま"
She shared the experience in freshman days.Even though the job we take in daily life connects to customer and value of the service.I felt sympathy with her message and wanna remember the purpose and goal of work. 3rd Speaker TM Hirohisa "飯田橋ロマンス"
The title caught audience‘ attention！He shared the success story of family rental bussiness in US humorously and vividly.He reccomend we Cosmos at Iidabashi woull start this bussiness. We had seasonable and enjoyable Table topics.After Table Topics TM Yukako and Ayako held the mini lecture for TT.We enjoyed and learned these session. When we take TT Master, we select topics , topics speakers and can learn time management and appropriate comments due to limited time. 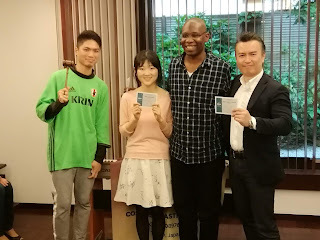 Cosmos Toastmasters club always welcomes new members and guests.Looking forward to seeing you at Iidabashi. Meeting report on 114th Cosmos TMC Regular meeting on May. 19th, 2018. The meeting was held at Atlas Edogawa Apartment room 153. Encouraging opening remarks and cheerful guest introduction were made. Smoothly conducted by TM Yuka and TM Shigetaka. Campaign speech for the candidate of President was delivered by TM Mineko. All nominated candidates were elected. Elected candidate delivered 2-minute speeches. TM Sam told the importance of challenge and purpose. TM Hirohisa shared his commitment to Pathways launch. TM Yukako shared her intention to welcome guests. TM Mami shared her confidence. 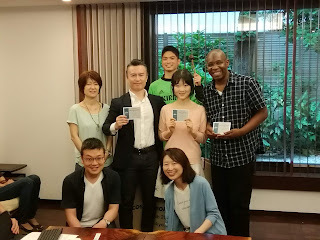 TM Ryoko shared her idea to let the meetings enjoyable. Installation ceremony will be conducted on June 16th. ■Word of the day, "Jolly" by TM Hirohisa, introduced by Mary Poppins. She shared the meaning of "pay forward" and that can be connected with her toastmasters experiences. 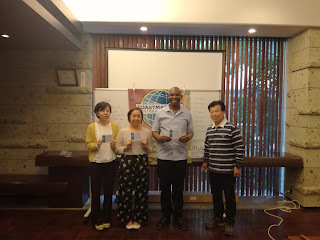 She strongly delivered her intention to support the people through toastmasters. She shared her experiences of failed choices and the moment she learned the importance of the life itself. She shared coming back is a courageous action. She shared the experience when she had an audition for a musical play. Also, she connected the experience to go into "Pathways" to conclude we should just do it. He shared his father's story as his navigator in life. He demonstrated his strong will to work abroad or work with foreign countries. TM Mami conducted this session from her personal interests, which was not so appropriate as table topic session. TM Hiroe did fine job when she was appointed to speak. Yuta san(Guest) also did fantastic job. 1st Evaluator: TM Seiken demonstrated his gentleness and strength by focusing on evaluator role which he had been assigned. 2nd Evaluator: TM Mineko evaluated the speech mainly from the perspective of contents by adding her sense of humor. 3rd Evaluator: TM Sam evaluated in precise manner by sharing how to deliver in alternative way with his sense of humor. 4th Evaluator: TM Yukako evaluated the speech by referring to the three major well-done points. All evaluator encouraged the speakers and added some improvement points with gentle mind. Cosmos welcomed 6 guests with warm atmosphere. Especially we welcomed TM Chika, who is the second time District Champion. It was really honorable moment for us all. 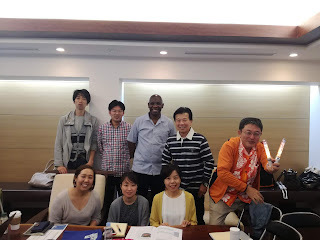 And we welcomed Numata family and they appreciated for our attitude in sincere mind. Cosmos is always open to anyone and show full acceptance. If you are interested in our club activities, please feel free to come and visit us. Cosmos TMC club is one of the best places to enhance and learn your communication and leadership skills.Let's learn together.